Go CHECK OUT a telescope from your local St Charles County Library today! The Astronomical Society of Eastern Missouri ("ASEM") Library Telescope Program has partnered with the St Charles City - County Library District to provide functional, easy-to-use telescopes for the general public to borrow. We hope that people who have never looked through a telescope now have the chance to experience the excitement that comes from discovery. The program takes advantage of the public library system infrastructure to place telescopes in local public libraries for circulation just like a book. Library patrons age eighteen-years or older with a valid Library card are able to check out a telescope for seven days. 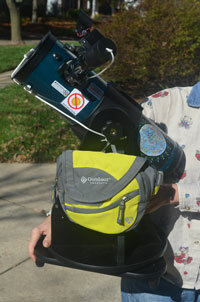 ASEM uses the Orion StarBlast 4.5" telescope for its program. Each telescope is modified by ASEM to be more durable and patron friendly and is equipped with accessories to help library patrons explore the night sky, including a user’s manual, constellation guide, Moon map, and night light. ASEM also provides the libraries with ongoing educational support and telescope maintenance. Throughout the year, libraries host star parties – telescope viewing sessions where the public can gather to view the night skies through a number of telescopes operated by ASEM members. ASEM modeled it's program based on a design by Marc Stowbridge and the New Hampshire Astronomical Society. The New Hampshire program was launched in 2008 and has proven highly successful with over 100 participating libraries and waiting lists for patrons to “checkout” the telescope. We (ASEM) collaborate with the St Louis Astronomical Society ("SLAS") to market and care for the program in the exact same fashion in the metropolitan St Louis area. Never grab by the throat (eyepiece or focuser), always pick up and carry from the bottom. Don't poke your fingers in the "eyes" (Optics - eyepiece or anything 'glass'). Don't even clean the 'eyes'. Don't be a doctor, if something is not right, take it back to the Library or contact us at LIBRARYSCOPES. We are glad to fix it! Don't leave un-attended by an adult (particularly outside in the daytime). NOT for use as a solar telescope! Please make sure to turn OFF the Finder Scope to save the battery when you are finished. In conjunction with the 2017 total solar eclipse, ASEM and SLAS assisted the libraries in obtaining 12 Galileo Solar Scopes, for use by Library personnel (riding piggyback on the LIBRARY SCOPE) or by educational professionals (teachers). These are not available for general public check-out. FOR TEACHERS ONLY: ASEM has provided ONE SUNSPOTTER solar telescope that is very easy and safe to use and share views with students. This can be used for solar eclipses as well as for viewing LARGE sunspots (Earth-sized or greater). Contrast is even sharper if skies are truly clear and bright. For current sunspots, check with www.spaceweather.com (see "Daily Sun", shown on left margin of that web page). Teachers can check this small scope out at the SPENCER ROAD library only. We encourage Library Patrons to take the scope out to BROEMMELSIEK PARK (astronomy area) to observe from a somewhat dark, unobstructed site. You will likely find ASEM members present to help on clear nights, especially on Friday Nights. "What to observe?" - start with the current month's sky map at SKYMAPS.COM. We also encourage you to come to our BEGINNER MEETINGS held at Weldon Springs Interpretive Center (next to the DOE mound) each month. Many other resources on our other ASEM web pages!